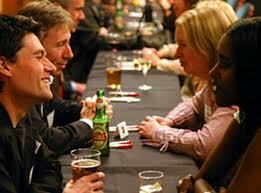 4mgsolutions.co.uk - What’s the difference between speed dating and speed networking? What’s the difference between speed dating and speed networking? Most of people have heard about speed dating but not everyone has heard about speed networking.And funnily enough, there’s not a lot of difference between the two - they both introduce you to potential partners: potential partners for life (or so I believe) or potential partners for business. The speed element is how quickly you make the connection. Will this person suit our life or suit our business? Both these decisions can be crucial to your future. Leaving dating aside for the moment, networking is one of the most effective marketing tools for any individual, business or organisation looking to raise its profile, expand its client base, build business opportunities, engage with like-minded communities, enhance knowledge and expand your sphere of influence. It is a low-cost marketing method based on referrals and introductions, either by face to face methods or through electronic means such as phone, email or the web. Most of us prefer to do business with people we like, know and trust. Business networking has the added benefit of recommendations, referrals and personal introductions providing us with that perfect opportunity to be introduced to a wider circle of people, to get to know them and grow to trust them. Business networking offers an alternative way to reach people who may be otherwise difficult to engage with using the more conventional marketing methods. Speed networking takes it to the next level with a quick and efficient way to meet lots of potential customers or suppliers in a short space of time. Fast paced from the word go, speed networking is the only event where you pitch face-to-face to everyone taking part. You need an elevator pitch ready – that’s what you would say when you have just one minute to influence someone about your idea, business, plan or programme in an elevator moving between floors, as well as lots of business cards and a smile. Other rules that apply: make yourself valuable and memorable so people will want to make you part of their network; give before you take; and remember what your mother taught you as a child – make friends, play nice, tell the truth, stay clean and do your homework. The Richmond & Twickenham groups of 4Networking, the largest business networking organisation with over 300 groups throughout the UK, will be running 3 free speed networking sessions at the Richmond Business Expo on Friday 26 April 2013. Attendees will have the opportunity to meet up to 40 local businesses during each session to give and take for their business. It will be a fantastic opportunity to raise your profile and get your name and your brand out there for free. Register at www.richmondexpo.co.uk to take advantage of this fabulous opportunity or come and talk to us about it at the 4N stand on the day.